Home > Browse by Subject > Local & Regional History > The Incredible Inman's Louisville Trivia Challenge! The Incredible Inman's Louisville Trivia Challenge! 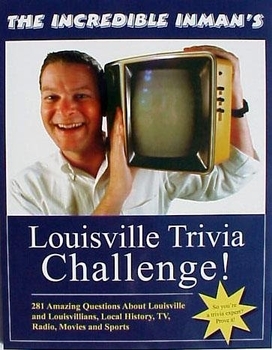 Trivia fans will delight in this extensive book of fill-in, matching and multiple-choice quizzes that dig into and expose Louisville's illustrious history and its many connections to television, literature, music, movies and sports — from Elvis Presley's relatives to the "Rocky and Bullwinkle" cartoon series to Diane Sawyer's first TV news job. There are 27 quizzes in all, with 281 questions that will be sure to stump you, entertain you and give you plenty of interesting anecdotes about the city, its people and its institutions. David Inman is perhaps better known as The Incredible Inman by the millions of people who read his syndicated newspaper columns on television and movie trivia. He is also the author of Randy, Cactus, Uncle Ed and the Golden Age of Louisville Television, published by Regency Books in 2001.